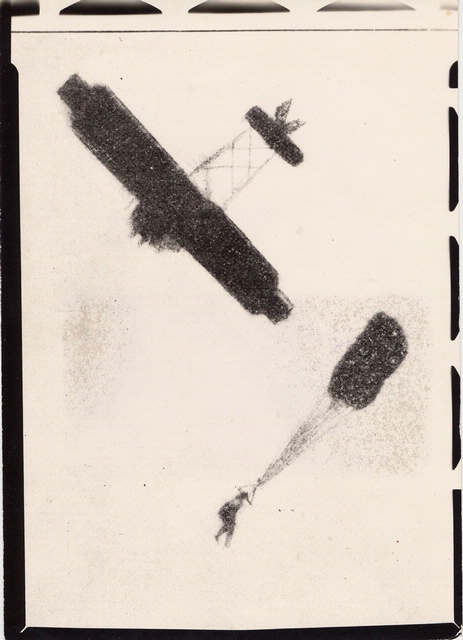 1 March 1912: At Jefferson Barracks, St. Louis, Missouri, Captain Albert Berry, United States Army, made the first parachute jump from an airplane. Pilot Antony H. Jannus and Captain Berry took off from Kinloch Field, a balloon-launching field in Kinloch Park, (now, Lambert–St. Louis International Airport, STL) and flew aboard a 1911 Benoist Type XII School Plane, 18 miles (29 kilometers) to the drop zone at Jefferson Barracks. The airplane was a pusher biplane which was based on a Curtiss pusher, and is also called the Benoist Headless. Barry had his parachute packed inside a conical container mounted beneath the airplane’s lower wing. They climbed to an altitude of 1,500 feet (457.2 meters). When the reached the desired altitude and were over the barracks’ parade grounds, Berry attached the parachute to a harness that he was wearing, then lowered himself on a trapeze-like bar suspended in front of the wings. He pulled a lanyard which released him. The parachute was opened by a static line. ST. LOUIS, March 1. —For the first time in the history of a heavier-than-air flying machine, a man leaped from an aeroplane at Jefferson barracks this afternoon and descended safely to earth in a parachute. Capt. Albert Berry made the spectacular leap and it was witnessed by hundreds of cheering soldiers. 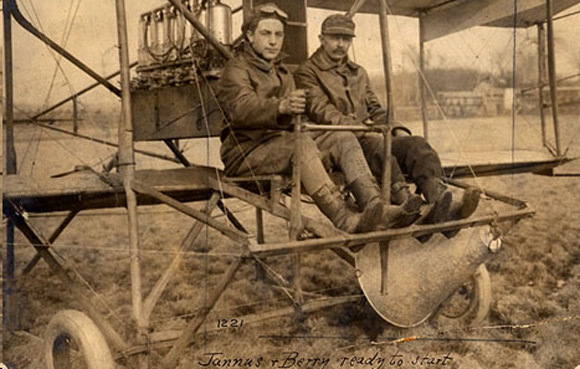 Berry and Pilot Jannus left the Kinlock aviation field in the afternoon in a two-passenger biplane, carrying beneath the machine, in a specially constructed case, a large parachute. With practiced hand Jannus steadied the machine, Berry gave a quick jerk of a rope and, while the aeroplane, first bouncing up like a cork, suddenly poised and steadied itself. Hundreds of watchers held their breath as Berry shot toward the earth, the parachute trailing after him in a long, snaky line. Suddenly the parachute opened, the rapidity of the descent was checked and, amid cheers, the first aviator to make such an attempt lightly reached the ground.